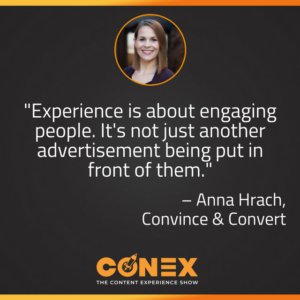 Anna Hrach, Strategist at Convince & Convert, and Randy Frisch, Co-Founder, CMO, and President of Uberflip, discuss the upcoming changes in the Content Pros Podcast and the importance of the Content Experience. It’s a safe bet to say that most businesses today have a grasp on the idea that content creation is important. Many would even argue that having good content is an essential part of modern marketing. However, whether you’re producing videos, blogs, webinars, or any other manner of content, merely having a quality piece of material isn’t cutting it anymore. As marketing has evolved consumers have evolved with it, and it’s becoming clearer that another form of clever advertising isn’t enough. Consumers are looking for an experience, and with some creativity, you can provide that stellar experience. Randy: Welcome to our podcast. Now, as you heard at the beginning of the podcast and if you're a subscriber, you're probably used to hearing this being called Content Pros. But, you heard that fun, new music that I'm really excited about. And isn't that a good vibe? Anna: I love it. I'm so glad we got to help pick that out. I think that actually was your pick. Randy: I don't know. We were going back and forth. We had one pick of music, and it was a good vibe, don't get me wrong. But like, we wanted something that was gonna be exciting and really launch this new podcast, but it's not really a new podcast because we've been doing Content Pros together with Convince & Convert for three four years now. And it's been such a great experience for me talking to amazing content leaders. And that's one thing that we said we do not want to change. Over the last few weeks, Anna, you and I have gotten to know each other as you joined this podcast. Randy: We said there were things we wanted to change, but there were also things that we were like, no way are we going to change. One was the types of guests. Because, I think we've got a great network between the two of us and between Jay Bayer standing behind us. But there was one area that you had started to talk to me about in terms of your background. And you know, we saw eye to eye. And that's experience. Maybe you can just, tell us what experience means to you. Anna: You know, it's funny. Experience means a lot to a lot of different people. But when we start to talk about the Content Experience, it's really the entire package, right? It's not just about marketing your product with content. It's not just about getting to that end conversion. It's really about the entire experience, that helps users find the information that they seek. It's about engaging people. It's not just another advertisement being put in front of them. It really is just how we guide them, it's about their journey, it's about, you know, even if they see this content on mobile versus desktop. It is literally the entire content world and the entire content package that we deliver to users. Randy: I love the way you put that. And I think that's where, when we kept kind of going back and forth, whether it was on emails, whether it was in the lead up to some of the podcasts we've been doing together lately. It was kind of like we realized that talking about the content experience is taking content marketing to the next level. Randy: And, not to take away anything in terms of what's been accomplished by marketers, adopting content marketing over the last five ten years, but I think we're actually ready to go to that next level. We're ready to say, okay, we've figured out how to create content. How do we start to use all this content? How do we start to make it part of our actual marketing practice? As opposed to view it as this siloed thing that's being tested in the side, and may or may not make it in the long run. Anna: Totally. And you know, it's funny Randy that you mention that about content creation, because you're right. I mean, you know, time and time again when we talk to people and you see studies come out. People have content creation down. That is not our problem anymore. That problem that we have now and that we're all confronting is where do we go from here? We have all of this content, now what do we do with it? And it really is that next level of content is the experience, and how people experience it and how people consume it and how we can deliver it to them in more meaningful and personalized ways. Randy: I have some stats for you, because I know some of our listeners love stats, and it actually helps us drive it home for our bosses when we have to go to them and kind of make our case. You know, as we had to over the last decade or so for investment in content. But, first is. Getting money to invest in content has become a lot easier. In fact, 39% of North American marketers indicate that they're going to increase their content spend this past year. And I know that's only going to increase again in 2018. But the more interesting stat to me, and this is the one that you just hit on, is that, this one came from a company called The Mangen Report. That we actually can generate 20% more sales opportunities, when we nurture our leads with personalized content. And that's that really custom content. It's the content that has purpose that is wrapped around what we call the content experience. Anna: Nice. And that is an insane stat. And that is something that just content creation in a silo alone, unfortunately can't accomplish. Even the best content in the world, without that sort of experience attached to it, it's just never going to see those numbers. Randy: Yeah, it's funny. Like, I'll talk to a lot of people, and we used to all say this. We're like, oh, we have this one blog post and it just does so well for us, right? And you're like, okay, what does it do well? Well, you know, we get so much traffic to that blog post. Randy: I often question those people. I'm like, listen, that's great. In fact, it's not that it's easy, because for a lot of us to find that right topic or that right headline or the right SEO, you know, focused around that post to drive people in. That's not easy. But what are you doing after that? Right? And, are you sending every visitor who finds that post to the exact same experience? And when I say experience, that could be a question of, is that optimized for the different device they're on? Are we giving them in same format, if we know they like video versus they like a blog post? Are we thinking about the next piece of content that they may care about, depending on what vertical or industry they're in. All these things make up that definition of what is the content experience. And what I want us to really do, as we bring on these same amazing guests onto the podcast, is really challenge them so that we can learn from them, not only what content did you create, but how did you actually package that up to drive more impactful business results in your organization. Anna: Totally, cause, you know, Randy as you mentioned at the beginning too, you know, Content Pros has always had the most amazing guests. And that's gonna continue. It's just about expanding and evolving some of those conversations. We're still gonna have a lot of those same great guests, we're still gonna have all the content questions about creation will be in there for sure, but we're just going to expand that. Randy: So, it's interesting, we've kind of been doing this whole lead up, and I've used the term probably a half a dozen times now, though I lose track because I use the term content experience all day long. The content experience is the new name of this podcast. 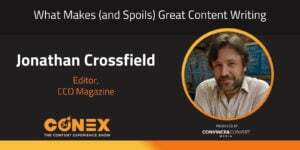 For short form, those listening, you want to tell someone you've subscribed to the Content Experience, you can also say Conex. Conex. And you know, after you and I started talking about this, we had to go to kind of the grandfather of Content Pros, Jay Bayer, who's behind Convince & Convert, and say Jay, are you interested in rebranding this podcast, a podcast that has over 10,000 monthly subscribers, to say like, do you really want to make this change right now. And it was a big decision. We all talked about it, there was a lot of emails going back and forth, pros and cons. But I think one of the things that we decided on is the opportunity to continue to build the movement. And maybe Anna, you can speak to some of the exciting news about how CNC is going to get behind Conex, beyond just this podcast. Anna: Yes. So Convince & Convert is going to be taking on a sort of much bigger role with Conex this year. We are actually going to be, they're sponsoring a couple of things. And you're going to see a couple of us on stage. Of course, Jay is going to be there. And for those of you who follow Jay and you've known Jay and you see Jay speak all the time, you know that he is all about experience. And he is specifically about customer experience. And just really providing, you know, not to sound like a broken record, but the best possible experiences through content. So, Conex is just a great fit for CNC. CNC is a great fit for Conex. And it's just going to be amazing and fun and awesome. I can't wait, I'm really excited. Randy: I know, me too. And for those who have not experienced Conex before, Conex is a two day event, actually I guess three days now, as it's grown over the years. It happens every summer, end of August, in Toronto, Canada. It's not always cold up in Canada. It's actually beautiful in the summer. And you know, we have an amazing lineup of speakers who come. Jay, as you touched on, is keynoted and brought a lot of fun activity to the event over the last couple of years. 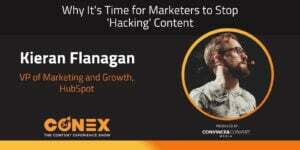 And as we look to really drive home with marketers, learn from marketers, how they're embracing Conex, what we wanted to do is have not just the event, not just all the content we've kind of amassed over the last couple of years, it's been record and will be available to everyone who subscribes to this podcast. But also, tie the podcast in. And to us, that's a big part of us trying to build a movement together, and find as many marketers who subscribe to the importance of what we do after we create that post. Anna: Yes. And I can also confirm, one, the conference is amazing, and two, Toronto in the summer is beautiful. I actually was there last summer, and miss it dearly. It was amazing. Randy: It's great. Other than our love for hockey, and things like that, we have a lot of great things up here in Canada. And I can go on and on about them. One of them that everyone has to try if they ever come here, is what's called a beavertail. Have you ever had a beavertail, Anna? Anna: You know, I feel like I missed that when I was there. But I feel like I know what it is. But I'm going to let you go ahead and describe it in case I get it wrong. Randy: Okay. So, beavertail, and it's winter season now, so, it is ideal in the winter. I don't know why, when I describe it. But, basically, thing of a deep fried pastry, that then gets covered in the most amazing toppings. Now, you can put anything on top of this thing. You can put like Reese's Pieces peanut butter cup like chocolate sauce all over it. But my favorite is just simply cinnamon and sugar with a sprinkle of lemon across the top. And it's this long, thin pastry. It is so delicious, it's so amazing. And they sell it in kind of these strong environments that you often go to, and I think that's why we always associate it with winter. But, you can also get it in the summer. And I will make sure that anyone who comes visit in Toronto, gets a beavertail. Anna: That is done. I'm there. It almost sounds a little bit like fry bread, like, we have that here in Arizona. Or almost sort of like Canadian funnel cake. Randy: I would agree. Like, similar flavors to the Cinnabon experience. But not the same degree of guilt associated with a Cinnabon, right? Anna: Interesting. Even though it is deep fried delicious pastry. Randy: Yeah, I think our producer is chiming in in the background here and telling us that they have something called elephant ears. Which I'm curious what an elephant ear is. But, listen, we're Canadian. We like, the Beaver is for some reason our national animal. So I guess that's how it took over. For sure, people are going to be tweeting about this right now, being like, the beaver is not the official Canadian animal, or something like that. So, I apologize if I have misspoken. Anna: I'd love to hear what everybody else's regional beavertail is. Like, elephant ears, fry bread, I'm sure every state has a different county fair version of it. Randy: Well, it's so ideal that you just brought that up. Because one of the things that we want people to start to do is when they're sharing this podcast, is start to share with the hashtag Conex. So what we could do is say, after this episode airs, maybe tweet out your favorite cinnamon based treat, referencing the podcast in the recording, and the hashtag Conex. You can throw hashtag beavertail in there too, if you need to put multiple hashtags, if you're one of those people. And we'll see where this thing goes. Anna: Love it. It'll go viral. Randy: I'm expecting it. So, basically, here's what to expect from the new Content Experience podcast. The podcast will be a weekly podcast, featuring myself, Randy from UberFlip. Featuring Anna from Convince & Convert. Our first guest, coming up, will be Jay Bayer from Convince & Convert. 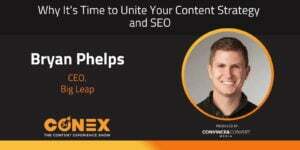 Jay is going to explain how he has bought into Conex. Some of the things he's planning to do tied to the movement in the coming year and time beyond. Of course, this is a movement. It doesn't end in a year. That's what trends are. And we're gonna have a lot of fun. We're going to have great guests, who again are going to continue to talk about how they create content, how they distribute content, how they look at what content's working, but at every stage there we want to hear from people, what is the type of experience that you're putting in front of your customers? And what type of impact is that driving on your business? And I think that's the type of information that all of us can use to better ourselves as marketers on a day to day basis. Anna: Totally. Especially since you see a lot of the content marketing institute surveys over the last few years have been the same story over and over, where we have all this content. Again, like we talked about at the beginning of the podcast, we have all this content. Now, what do we do? This is going to be a great way for guests to come on, and help answer what next, and where do we go from here? How do we make that content experience that much better? Randy: So listen. If you've enjoyed Content Pros, stick with us. Just a name change. And as you already can tell, you're going to learn about all these unhealthy treats along the way that are going to keep you enjoying your podcast, coming up to Canada to visit us when you have time as well. Until our next podcast, I'm Randy, Anna's with me as always, and we can't wait to bring you the Content Experience.